Benchmark Estimating has today unveiled the latest release of our estimating software – Version 7.5. With smart new features, improved performance and seamless integration, Benchmark Estimating Software Version 7.5 is the most advanced estimating solution on the market. Smart new features like Load Revision, the Project Comparator, Composite Items and additional estimate levels are ideal for today’s complex estimating challenges and provide users with greater flexibility to meet their customer’s needs. Version 7.5 includes a user customisable ‘My Benchmark’ window that promises a more customisable user experience as well as increased personal productivity. A new database engine also offers average speed improvements of 400% on many features when compared to the previous version. Integrating your estimating with your other business processes has also been made easier with the improved Integration Module in Version 7.5. Offering dynamic communication between Benchmark Estimating Software and your accounting ERP and/or job costing systems, the Integration Module helps organisations to eliminate double entry of data and maximise the productivity of their workforce. Benchmark Estimating CEO Rob MacDonald has welcomed the release of Version 7.5 saying “this is the most advanced release of our software to date. Our aim was to provide users with an intelligent estimating system that offered advanced pricing features while still maintaining our trademark flexibility and ease of use and Version 7.5 has not disappointed. It’s smart, fast and it delivers a first rate user experience that you just don’t get with other systems”. 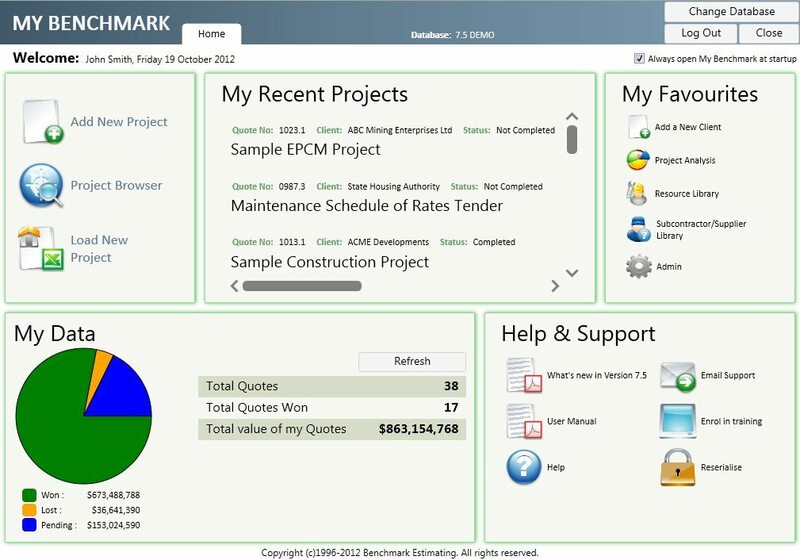 For a full list of features offered in Benchmark Estimating Software please visit our features page. A customisable “home screen” which gives you faster access to your favourite day-to-day functions, recent Projects and market share data. Composite Items allow you to build up rates for Items with greater flexibility regardless of how your client specifies their schedule. 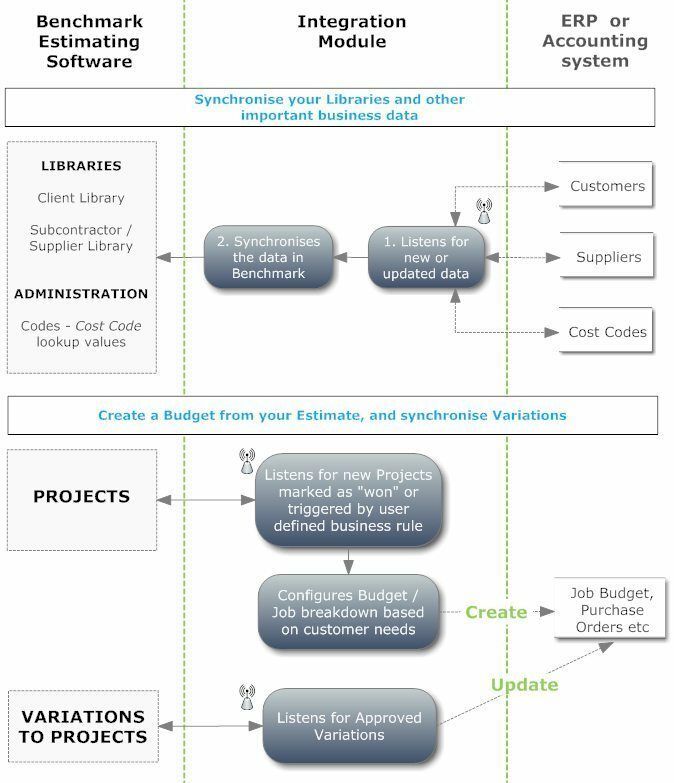 This means you will be able to price estimates to meet different client’s needs much faster and with greater detail and accuracy.Composite Items also “close the loop” on compliance with the structural requirements of estimating software for Building Information Modelling (BIM). Composite Totals offer more levels in an estimate meaning you can produce quotes with clearer, more logical formatting that will make them stand out from your competitors. The additional levels also make estimating major projects far easier and facilitate more flexible integration with detailed WBS reporting and analysis. 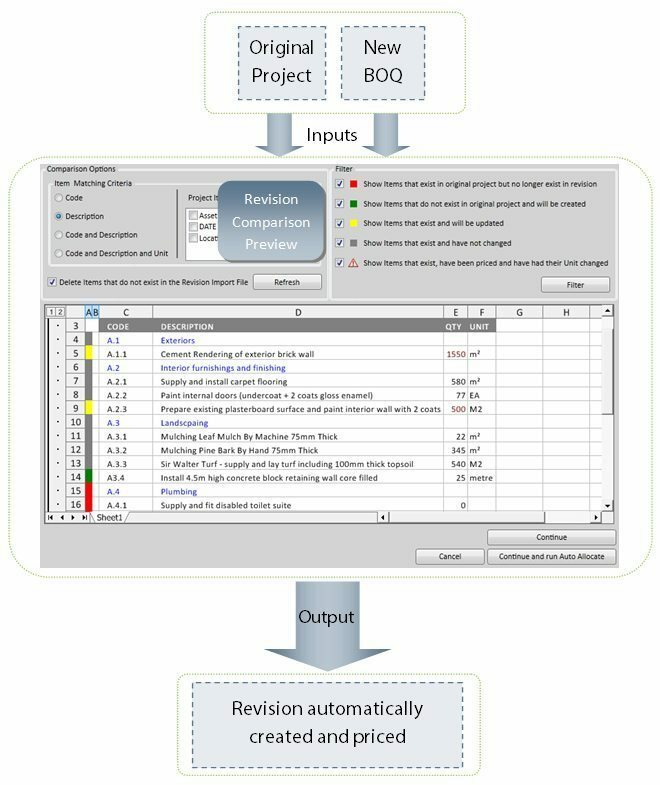 Load Revision creates and prices a revision to a Project automatically saving you time and ensuring that you don’t miss a thing when a bill of quantities changes. This powerful feature will save you time comparing revisions of estimates by allowing you to undertake powerful ‘what-if’ analysis to help with management decision making. 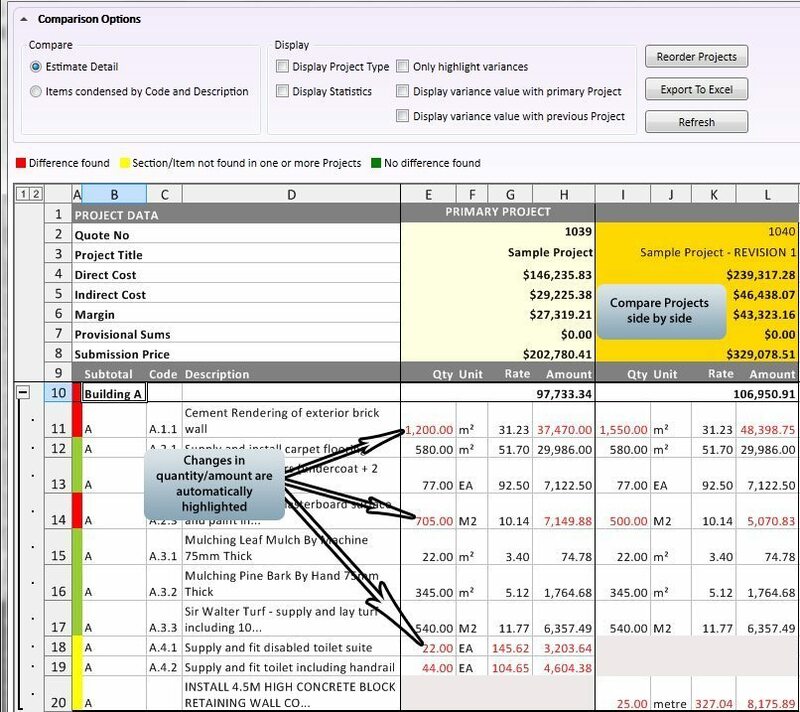 Project Managers can also use it to review and compare estimated margin details following refinement of their budget. Our Integration module allows for dynamic communication and easy integration of Benchmark Estimating Software with your ERP, Accounting and/or Job Costing systems. This aids in the elimination of double entry of data, streamlines your business processes and improves job costing reporting to help maximise profits. The Integration module is available as an add-on module for the Professional and Corporate editions of Benchmark Estimating Software. 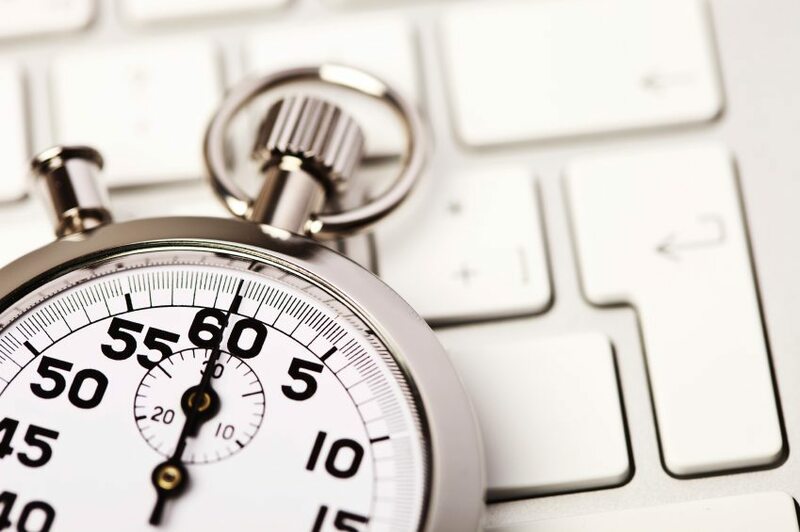 The driving force behind our software’s performance, Version 7.5 sees an improved database engine, giving you speed improvements of up to 400% on many functions meaning your estimating will be faster than ever before. 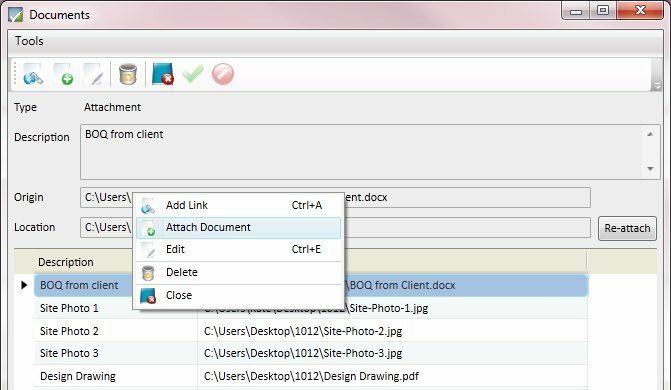 Collaborate more effectively amongst your team and improve productivity by eliminating the need to set up and maintain separate folders on your server for estimate documents. With this new feature, Benchmark Estimating Software can create a folder for each new project automatically. 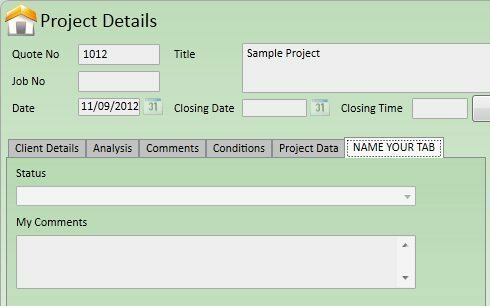 Word Quotes generated by Benchmark Estimating Software can also automatically be saved into their respective Project folders. 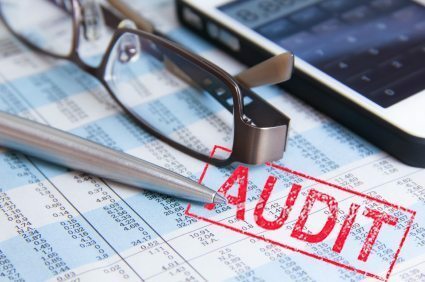 The new Project Audit feature keeps track of important changes made to a Project, the user who made the change and the date and time the changes were made increasing accountability amongst your team. Allows you to set up your own fields so that you can store additional data to assist you in custom reporting and business analysis. Version 7.5 introduces the option for organisations to write to an Oracle database. This is ideal for larger organisations as it gives you much more flexibility, ensures optimum performance, scalability and the ability to handle large volumes of estimating data. Benchmark Estimating is also a part of the Oracle PartnerNetwork (OPN) as a Gold Partner. This new technology feature sets Benchmark Estimating Software as one of the world’s most advanced estimating systems.